I hear repeatedly that we’re not supposed to judge another. Particularly Young People express themselves this way, and that’s not surprising. After all, not judging the other fits hand in glove with the postmodern dogma of Tolerance that’s so rampant around us. Different strokes for different folks, so let the other be; who am I to say that what you’re doing or thinking is wrong…. 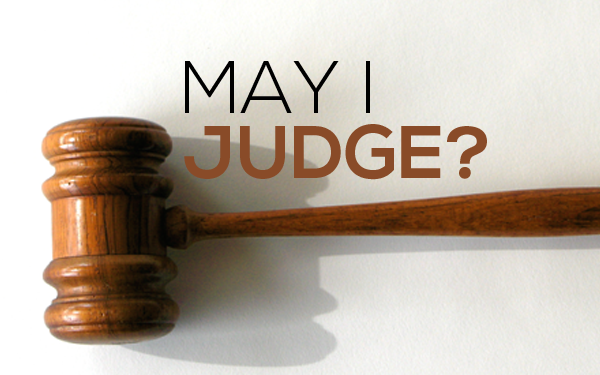 I’ve heard Christians appeal to Jesus’ words in the Sermon on the Mount to provide Biblical justification for the position, for Jesus told His disciples “judge not, that you be not judged” (Matthew 7:1). Case closed: do not pass judgment on another. But last week there was an internet page related in some way to a Christian High School that attracted close to 200 comments on a particular issue. A very high percentage of those comments passed judgment on a decision somebody (or body) had made – and the judgment was distinctly unfavorable. It left me puzzled. We’re quick to repeat the mantra not to judge. But this unpopular decision earned abundant judgment, and quickly too. Something is not consistent here. This sort of thing happens more often. In our relatively small community we hear numerous details of what happens in the life of the person in the next pew, or in the congregation up the road. And very quickly we have a judgment ready on what we hear. It affects what we say to another, and affects too how we think about or treat the person(s) about whom we heard a story. A quick judgment is simply unbiblical. Solomon put it like this: “the one who states his case first seems right, until the other comes and examines him” (Proverbs 18:17). The Lord in the 9th commandment gave the instruction not to “bear false witness against your neighbor”, and the Heidelberg Catechism summarizes the instruction of this command with this confession: “I must not … condemn or join in condemning anyone rashly and unheard” (Lord’s Day 43). That counts for what we say on Facebook too. We do well to repent before God and man of our easy judgmentalism, and seek to learn that God-pleasing habit of doing to others as we’d have them do to us. As we hate being on the receiving end of (perceived) gossip or slander, so we need studiously to avoid being on the giving end of gossip or slander. This does not mean, however, that I’m to be neutral concerning all I hear. The postmodern mantra that I’m to be OK with whatever anybody else thinks or does is simply not biblical. Consider, for example, John’s instruction to “test the spirits” (1 John 4:1). So much gets said, and people believe so many things. But I’m to test whether what they say and believe is “from God”. John emphatically wants us to have an opinion on that – and then reject what is not from God. Testing, of course, involves so much more than hearing one thing and swallowing it dumbly as the final word on the subject. Testing involves listening carefully, understanding the details and circumstances, and then evaluating in the light of the revelation of the Lord of lords. You’re meant to have a considered opinion. That’s why the apostle Paul was emphatic to the Corinthians that they needed to pass explicit condemnation on the brother in their congregation who lived in sin. They were not to be neutral on this man’s behavior, but were to take a stand and excommunicate him. That’s because in this instance the details were abundantly clear (it wasn’t hearsay but indisputable facts evident to all parties), and so the saints of Corinth were obligated before God to form a judgment and carry it out. That obligation was so self-evident that Paul put the matter in the form of a rhetorical question: “is it not those inside the church whom you are to judge?” (1 Corinthians 5:12). Judging: that’s your duty…. Is Jesus wrong, then, when He in the Sermon on the Mount tells His disciples, “Judge not, that you be not judged?” (Matthew 7:1). Actually, Jesus does not tell us not to have a judgment on what we hear or see. Instead, Jesus’ point is that we’re not to judge rashly. That’s clear from Jesus’ next line, “For” –yes, note that connecting word!– “For with the judgment you pronounce you will be judged” (vs 2a). If you are quick to condemn another, do not be surprised when others will be quick to condemn you; “with the measure you use it will be measure to you” (vs 2b). So if you hear one side of a story and condemn before you’ve heard the other side, be prepared to have folk condemn you on hearsay before they’ve heard your side of the story! Similarly, if you from a self-righteous height condemn the other’s behavior while you are yourself entangled in sin, do not be surprised that you’ll find no sympathy when others find out about your sin. Jesus puts it like this: “Why do you see the speck that is in your brother’s eye, but do not notice the log that is in your own eye?” (vs 3). That, Jesus adds, is hypocrisy (vs 5). As long as you try to hide skeletons in your own closet, you are in no position to draw attention to skeletons you (think you) see in someone else’s closet. May I judge another? It depends on what you mean by the word ‘judge’. I’m not to condemn rashly and unheard. But I am to have an opinion on my brother and help him in the way the Lord wants him to help me.